Options 12 Pack - 16.5" x 23.5". 28 Pack - 16.5" x 23.5". Four Paws, the maker of the #1 best selling brand of house breaking pads in the world- Wee-Wee Pads, is delighted to have created the pet industry's only housebreaking pad marketed specifically for little dogs. Four Paws Wee-Wee Pads for Little Dogs targets the vast, growing number of small/little dogs. Wee-Wee Pads for little dogs are sized just right for smaller dog breeds-16.5" x 23.5". The pads are so convenient, they can be quickly and easily placed ANYWHERE! 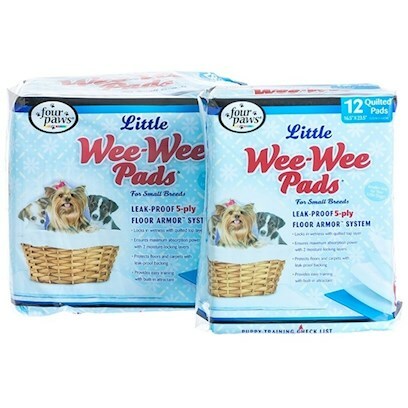 Like all Four Paws Wee-Wee Pads, they are highly absorbent and have been treated with an attractant so little dogs know "right where to go". Four Paws Wee-Wee pads are versatile in that they can be used for training-or as an everyday alternative to the outdoors when pets (or the people that care for them) are "housebound". The Wee-Wee Pads for little dogs are available in two packages-a 12 ct and 28 ct.